Feral rabbits were introduced to Australia in 1827 and covered most of their present range by 1910. Today, feral rabbits occur throughout Australia, except in the northernmost areas. 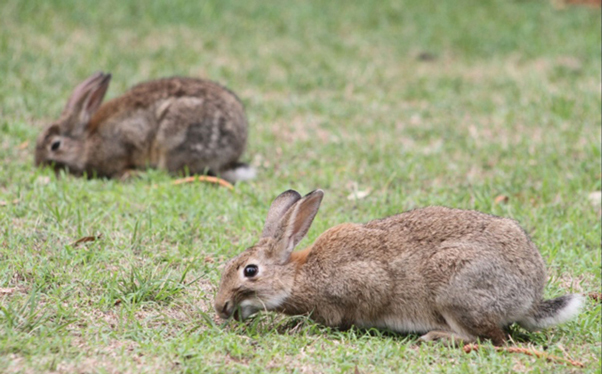 Impact: feral rabbits compete with native wildlife, damage vegetation and degrade the land. They ringbark trees and shrubs and prevent regeneration by eating seeds and seedlings. Their impact often increases during drought and immediately after fire, when food is scarce and they eat whatever they can. Competition and land degradation by feral rabbits is listed as a key threatening process under the Commonwealth Environmental Protection and Biodiversity Conservation Act 1999 (EPBC Act).